Competitor analysis can be a complex, time-consuming and expensive affair using data from a number of sources, lots of which is quite expensive. However, it is possible to get a good overall impression of your competitors and what they’re up to without spending a penny – here’s our guide to analysing your competitors using free tools. This version of our guide makes use of a free tool that sits on your Chrome toolbar, a version is also available for FireFox. The tool is published by MOZ, a well known publisher of SEO Tools and you can download and use it for free from this link: https://moz.com/tools/seo-toolbar (This is not an affiliate link and we receive no commission for it). You will also need a copy of our basic competitor survey grid, as shown below. When you have downloaded and activated the MOZ tool, go to your browser and perform a search for a keyword or phrase that is important for you. For this example I have used the example search phrase “london carpet cleaning” to generate these results, you simply substitute your own words/phrases. A website’s Domain Authority is calculated by MOZ based on a number of criteria which reflects how influential the site is, compared to others. It is taken by many people now as being the closest to Google’s own “PageRank” metric which is no longer published in the public domain. As for Domain authority but this measures just the page rather than the entire site. Google regards the number and quality of naturally occurring links leading to a web page to be indicative of its popularity and of the level of trust people put into it. Websites with a high DA along with a high number of links, will generally be further up the listings than a site that has none, or lower numbers of, these metrics. Underneath the Google Map there are the three “Pack” results. These are listings of local businesses that match the search criteria based on their category. The websites listed here are also marked on the map. Below these is the first of the “Natural Search” or “organic” search results. Underneath each listing you can see the grey bar which the MOZ tool puts there. It shows some important information that will help us to work out why the sites are are shown in the order that they are. We can see that this website has a D/A of 25 and 852 links. The next listing down, cleanthatcarpet.co.uk has a lower Domain Authority at 21 and fewer links @ 41. Thirdly, missmaid.co.uk has a D/A of 24 and 169 links. So why is cleanthatcarpet.co.uk higher up than missmaid.co.uk when their DA is lower than theirs? Well, Google never publishes its “algorithm” or formula that it uses to calculate this but the metrics given to us by the MOZ toolbar shows us that the Page Authority for cleanthatcarpet.co.uk is higher than that of missmaid.co.uk by quite a large margin, (34 vs 15) and it is this has has probably made the difference. Then check your own results by looking down the pages until you find your own site. If you don’t see it then this search term is probably not one which Google has indexed your website for. In this case, try some different search terms and repeat the exercise. Although this is an oversimplification of a more complex problem it serves to give you a snapshot of where you are compared to your competitors. You can obtain a much more detailed Competitor Landscape for your business here. If your site is one of the top 3 then you have no problems as far as that search is concerned. If it isn’t then there has to be a reason for that – what is it that those in the top positions are doing that you are not? The answer to that question is often the key to unlocking a flood of traffic for your website. You can see that the only site to have all of the words in the search phrase in its url is the number 1 ranking londoncarpetcleaningltd.com. This is believed to be a big help in ranking higher than others that do not include the phrase. Clearly the difference in Domain Authority is the single biggest indicator of relative position. In this case we have a DA of 15 compared to three other sites each having a DA in excess of 20 so we are at a distinct disadvantage. 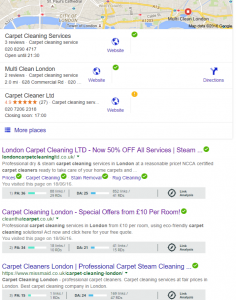 Londoncarpetcleaningltd.co.uk have by far the highest number of links as well as the highest DA and PA which combined put them in a leading position. Armed with this information we can begin to work on the areas of the website that require work, in this case this would be improving the Domain Authority. Our “Optimising & SEO” workshop will give you the details you need to make these improvements. N.B The urls used for this example were chosen at random for illustration only and we have no association with the owners.